[Brussels, 20 June 2018] Today is UN World Refugee Day; a day to ‘commemorate the strength, courage and perseverance of millions of refugees’. When countries welcome refugees our culture becomes more diverse, we deepen our understanding of the world and our economy benefits. Yet, across Europe today, thousands of women, girls, boys and men are living in inhumane conditions and are at risk of trafficking, abuse and exploitation because our leaders are not respecting their fundamental basic rights, nor the real and desperate need so many are in. In recent years, the idea of ‘fortress Europe’ has taken hold in many nations. We have seen calls for harder borders, more restrictive immigration policies, and sea operations have shifted dramatically from ‘humanitarian’ to ‘security’: this was highlighted in the last week with the Aquarius being refused entry in both Italy and Malta before the 629 presumed refugees, including six pregnant women and over 100 unaccompanied minors, were accepted by Spanish authorities. The Italian interior minister ‘declared victory’ following this approach. While resources must be shared across Europe, we should not be playing politics when people’s lives are at risk. 729 deaths have already been recorded on the Mediterranean Sea in 2018 so far. Anti-migration policies put women’s lives and well-being in danger. 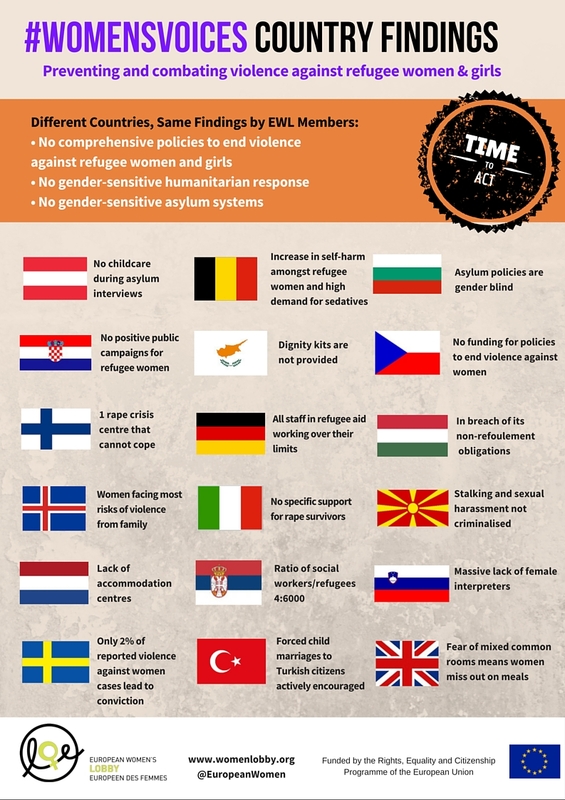 Despite 50% of refugees internationally being women or girls, too often migration, asylum and integration policies are gender blind meaning the specific needs and vulnerabilities of women and girls are ignored. Grooming and trafficking for sexual exploitation, forced marriage, violence and harassment are significant risks for women on the move. These experiences are compounded when perpetrators are not held to account, victims are not supported, and there is a lack of effective health, safety and counselling supports for women and girls in temporary camps and during the asylum process in many countries. We must prevent the need for these perilous journeys in the first place, create laws and policies that foster positive integration, provide language and health supports, and create an environment that enables refugee women and girls to return to their countries of origin if they so wish, with a gender-sensitive approach in all cases. Our Women’s Voices report sets out key recommendations that, if implemented, would significantly improve the conditions experienced by so many courageous women and girls deserving of a better future. Ratification and implementation of the Istanbul Convention, improved protection, service provision, violence prevention, prosecution and inter-agency partnerships are key pillars that would improve the experiences of women and girls on the move. We can and must do better. It is absolutely possible for Europe to better balance its resources and need for effective security procedures with the need to play our part to ensure adequate measures are in place in order to support some of the most at-risk in our society . Women on the move face enough challenges in search of safety and security; together we can continue to work for peace, to end the conflict that drives most migration flows, prevent male violence and support women and girls to fulfil their potential.